The snow theme is perfect in the winter! Kids will enjoy all the different projects, books, and activities. Even if you live somewhere with out snow you can still have fun with this theme. These themes are great homeschooling ideas! Mix equal parts white sand and silver glitter and place in large bowl with a ladle. 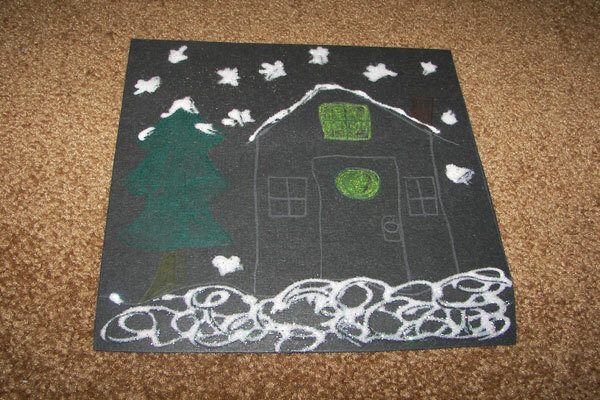 Gather up black and dark blue paper and with a pencil draw a picture of a winter scene. Anywhere you would like there to be snow add glue, and holding your paper over the bowl use the ladle to pour the sand glitter over the glue areas, then shake off the excess glitter back into the bowl. Make simple circle stencils in various sizes using cardboard leftover from cereal boxes. Using dark blue or black paper & white crayons trace the circle making them into snowmen. Decorate the snowman with glue and sand glitter. Cut pieces of wool felt to make hats, scarves, and mittens for your snowman. Using self adhesive foam prints with snowflakes on them. Stick them onto pieces of wood or cardboard. Using a small foam paint roller and some dipped with paint, roll over the stamps and stamp on butcher paper for holiday gift wrap. You can also use these in snow pictures, or use fabric paint and make tote bags, or shirts. Print out the snowflake templates offered. Trace onto cardstock or cardboard to make stencils. Or trace and cut onto winter decorated paper to hang from the ceiling or in windows. 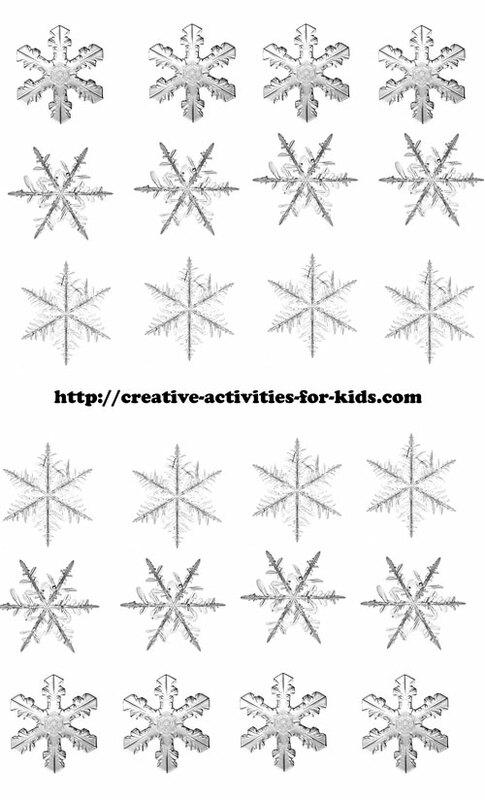 Print out my snowflake pictures below, color them if you want. Cut them out and mod-podge them onto rocks, wooden boxes, or magnets. All you need to do is right click on the image and choose save picture as. Tape your snowflake templates to white paper then roll over them with black paint, once they dry remove the templates to reveal beautiful night snowflake prints. Make Your Own Mittens : trace a mitten shape using your hand for the template, trace the pattern onto wool felt, or wool fleece that has been folded in half. Make 2. Hand stitch them together. Put them right side out and go out and enjoy the snow! If you live somewhere with out snow find a place that gets very cold that needs mittens! Mitten Garland : Trace the mitten template and trace it onto various colors of wool felt, using tacky glue embellish the mittens with various items like pom-poms, beads, yarn scraps etc. Using mini clothespins clip them on some yarn, bias tape, or string. Hang on mantel or in window. Check back often for more snow theme ideas! Did you like the snow theme? Check out more weekly themes here!